Bob Casino offers an attractive welcome package, including a no-deposit-bonus of 10 free spins, as well as a 100% bonus up to $100, plus 100 free spins upon the first deposit. The second and third deposits trigger a 50% bonus each, up to $200. Additionally, the 3rd deposit is rewarded with 30 free spins. Bob Casino's website boasts a great selection of games, which are listed in different categories for ease of use. The categories are New Games, Slots, Table Games, Popular Games and Recommended Games. There are many quality live casino games, including blackjack, baccarat and roulette, where gamers can play at live tables with friendly croupiers. Players searching for games from their favourite software provider can select games from a list. These include big names like NetEnt, Evolution Gaming, Betsoft and Yggdrasil Gaming, as well as less well-known providers such as Amatic Industries, 2 By 2 Gaming, EGT Interactive, Big Time Gaming, Endorphina, Quickfire, Pragmatic Play and Iron Dog Studios. 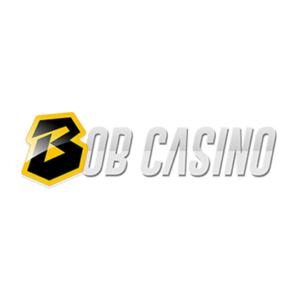 Bob Casino accepts deposit payments via the usual banking methods such as EcoPayz, MasterCard, Neteller, Paysafe Card, instaDebit, Visa, iDEAL, instant bank transfer, Trustly and Skrill. They also accept less familiar but equally as safe methods, such as QIWI, WebMoney, Yandex Money, iDebit, Promsvyazbank, Alfa Click, Cubits, Svyazno, Zimpler, Comepay, Evroset. Payments with Bitcoin are also accepted. To withdraw winnings from their account, customers choose from the following banking methods; bank wire transfer, MasterCard, Neteller, instaDebit, Visa, iDEAL, bank transfer, EcoPayz, Skrill, WebMoney, iDebit, Cubits, Comepay or Sberbank. Withdrawals into e-wallets are usually instant, debit or credit cards can take up to 24 hours at most. Bank transfers can take up to three days. The Bob Casino website can be displayed in many different languages, including English, Finnish, German, Norwegian, Polish, Portuguese, Spanish, French and Russian. This means that Bob Casino is accessible for a wide customer base all around the world. The list of restricted countries, where Bob Casino is not available, is relatively short. Bob Casino supports payments in a great variety of currencies, including Canadian dollars, euros, Norwegian kroner, New Zealand dollars, Polish zlotys, Russian rubles, Turkish lira and US dollars. There is a currency to suit almost everyone. Should players still need to pay in a currency which is not supported, a currency conversion fee will apply. Bob Casino is an instant play casino. Gamers can play directly in their internet browser, without the need to download anything. It also works seamlessly on most mobile devices, as the website and games are optimised for Android and iOS operating systems. Bob Casino also operates a live casino powered by NetEnt, featuring friendly live-dealers. Players in need of assistance can contact customer support via the live chat feature, and get instant answers to their questions and queries 24 hours a day, seven days a week. An online contact form is also available for less urgent enquiries. Getting support from Bob Casino staff is easy.